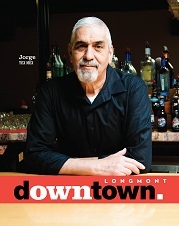 On June 13, 2014, the Downtown Longmont Creative District launched its new identity. After months of discussion, brainstorming and creative input, we are asking everyone to Own Downtown. Check out our video. After a lively discussion in monthly Arts Admin meetings, the steering committee for the Creative District, names for the district were discussed like “Longmont Creates”. With all the ideas at hand, the project was handed off to the Marketing Committee. After researching other identities and concepts, it was clear the marketing committee wanted something that could be used universally by the Creative District as well as downtown businesses. The committee also discussed that currently people referred to district as simply Downtown. So why re-create the wheel, or in this case the name? With Downtown Longmont as the focus, committee members and volunteers began creating possible designs. After several rounds of ideas and discussions, volunteer Debra Heiser, principle of Heiser Design, a graphic design firm specializing in brand development, unveiled a concept that captured the essence downtown and was unanimously agreed upon by the committee. Previously from Las Vegas and San Francisco, Heiser served as creative director and projector coordinator for the AIGA (American Institute of Graphic Arts) Las Vegas 18b arts district branding project, funded by a National Endowment for the Arts grant, and in collaboration with the Cultural Affairs division of the City of Las Vegas. 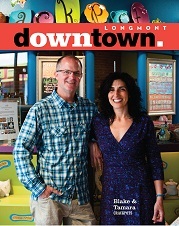 It is her experience with this project that brought her to the Creative District branding team of Longmont. She is a board member of the Longmont Council for the Arts and an active participant in both the Placemaking and Marketing committees for the Creative District. With a solid concept, the marketing committee looked at a variety of font and color treatments before selecting the final combinations. Fast tracking this project, they met every other week to work with Heiser on a series of banners, ads and creating a video featuring the “downtown” identity. The identity was previewed at the Envision Downtown Longmont event on May 14. Invitations and online elements were created to tease the new identity. Throughout design, the new concept was reviewed by the Steering Committee, Block Captains, the Program and Placemaking committees as well as the Longmont Downtown Development Authority and Downtown Longmont Community Venture boards – each time getting unanimous approval.